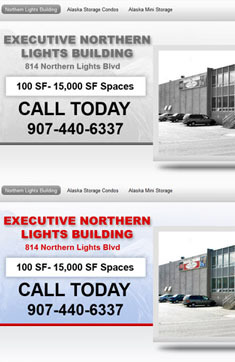 Far North Web Design provides quality Alaska website design and maintentance services at affordable prices. 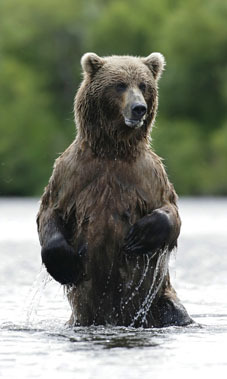 Located in Anchorage, Alaska Far North Web Design is ready to design and create your next website! According to research, almost half of your Internet visitors will judge the credibility of your business instantly based on website design. Are you willing to lose half of your customers? 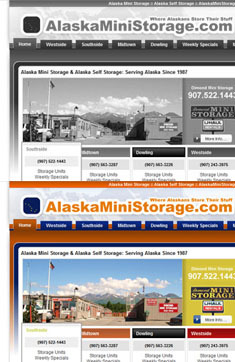 Simply put, we design beautiful, professional websites for Alaskans. We have many options to fit a variety of needs and budgets. Sick of your current "web guys" taking forever with updates and being unreachable? Leave them in the snow and come to Far North Web Design! We're always here to respond immediately to your inquiries. We charge an hourly rate and provide extremely prompt, professional results. The age of still Internet is gone and dynamic content rules the web today. 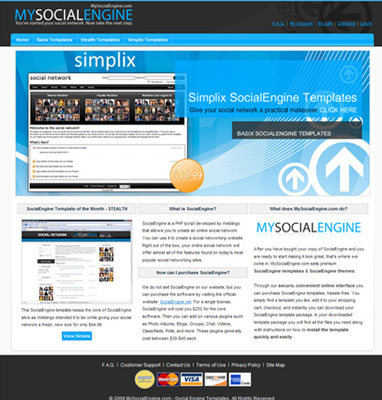 The task here was to create a "simple-looking" e-Commerce interface in which customers could browse MySocialEngine's Social Network web design templates, purchase the templates on line and instantly be able to download their purchased templates after paying, making the site 100% automated. The website is powered by our most advanced, award-winning shopping cart software, Magento with an Administrator area where they can upload new products, manage products, manage sales, and much more. 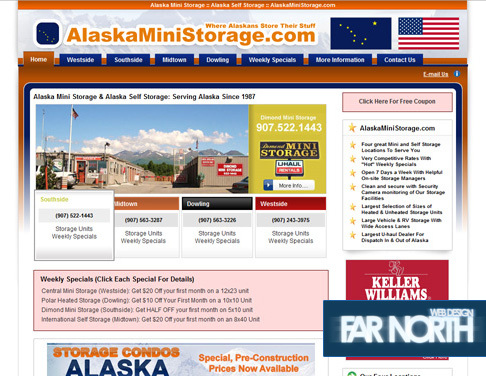 AlaskaMiniStorage.com represents several of Anchorage's biggest Mini Storage locations. They had been running a very old website for a long time and came to us to bring them "into the 21st century." So, we created them a brand new website built on our most popular Content Management System. Their website features a comprehensive back end Administration area where they can have their employees update the basic content of the website. 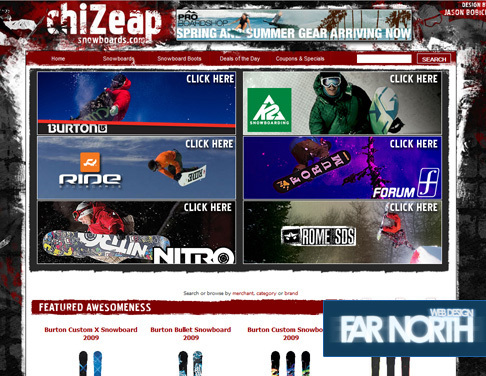 ChiZeap Snowboards runs with a simple, custom PHP/MySQL application we developed. We also designed the look 100% from scratch. 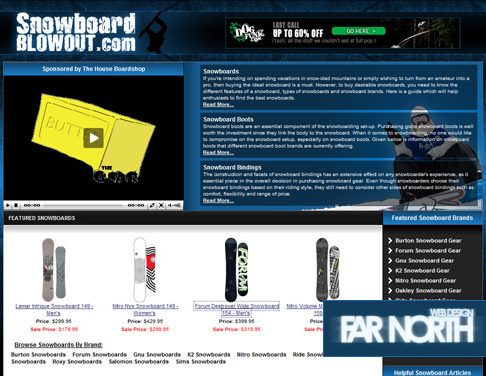 The website serves as an affiliate website that generates revenue from having a gigantic database of product catalogs from on line snowboard retailers, in which users can compare prices. 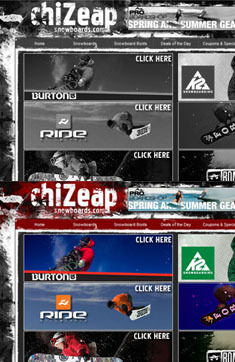 When website visitors click through from ChiZeap Snowboards to one of the sponsored on line stores and make a purchase, ChiZeap Snowboard site owners make a commission. 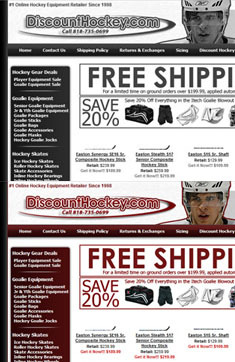 Discount Hockey is one of the leading on line hockey retailers in America. They had been around for about 10 years before they came to us. We completely re-designed their website, which is managed on the Yahoo Store Builder system, and did all of their Search Engine Optimization work. 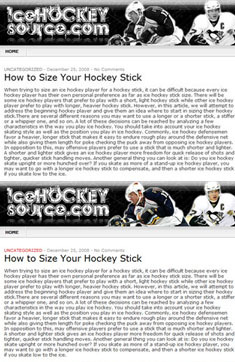 They now come up at the top of Google for Hockey Equipment and many other related terms. In the years since, their annual on line sales have nearly doubled. 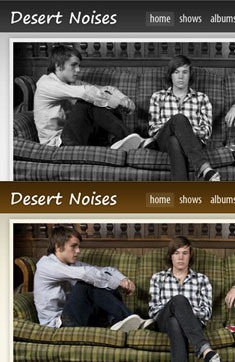 Desert Noises is one of the hottest indie bands to come out of Utah, operationg under the up and coming record label, Northplatte Records. They wanted a "simple, clean light-brown" design and so we gave it to them. This website is a perfect example of our most basic starter website packages. 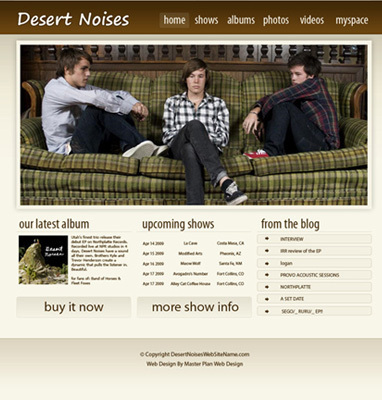 DesertNoises.com is a static website with no dynamic capabilities, which works out well for them, as they do not need frequent changes made to the site. 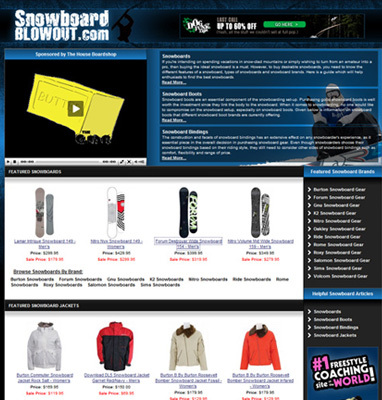 Snowboard Blowout is another affiliate website we designed and created for one of our clients. 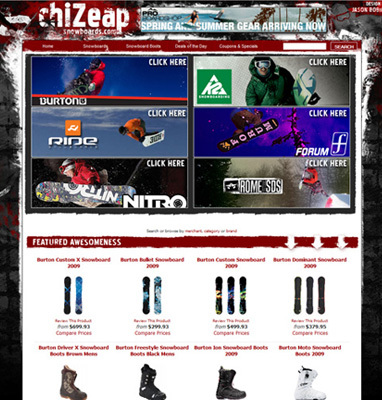 This is a static website built with PHP functionality so we could dynamically feed products from various on line snowboard retailers. 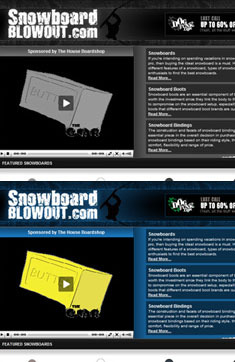 When website visitors click through from SnowboardBlowout.com and buy a product from a sponsored retailer, the SnowboardBlowout.com site owners make a commission. 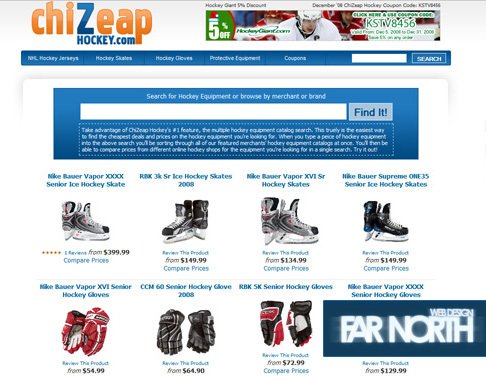 ChiZeap Hockey runs with a simple, custom PHP/MySQL application we developed. We also designed the look 100% from scratch. 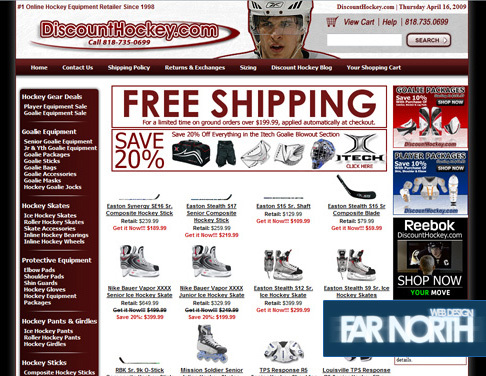 The website serves as an affiliate website that generates revenue from having a gigantic database of product catalogs from on line hockey retailers, in which users can compare prices. 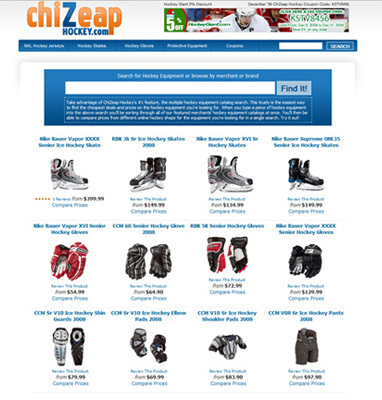 When website visitors click through from ChiZeap Hockey to one of the sponsored on line stores and make a purchase, ChiZeap Hockey site owners make a commission. 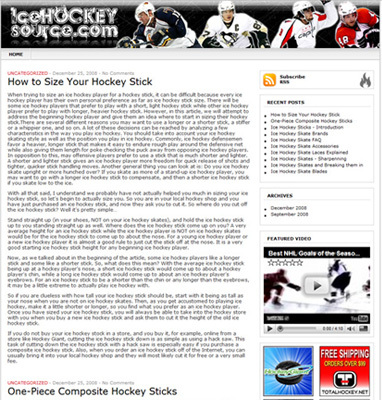 Ice Hockey Source is a blog for hockey players built with the #1 award-winning blogging software, WordPress. 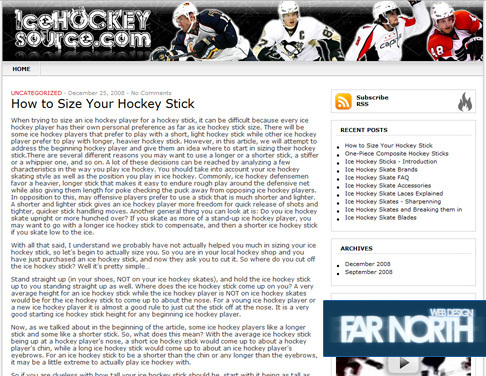 This is an example of what we can create for you if you're interested in a blog. We can install and setup WordPress for you, and then build you a custom template. After that, you're ready to keep your blog up to date. 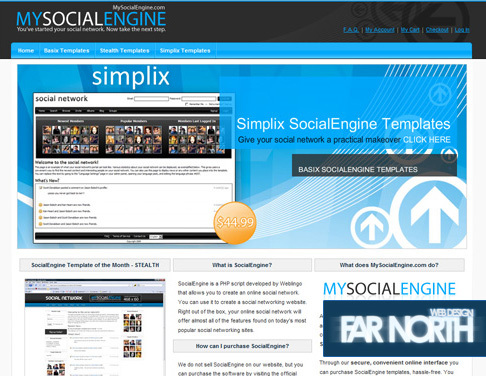 You will have a fully functional, 100% dynamic blog without ever having to do any HTML coding. 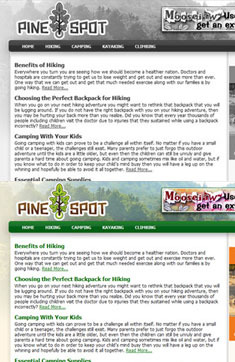 We can create you a stand alone blog website or add one on to your existing website. 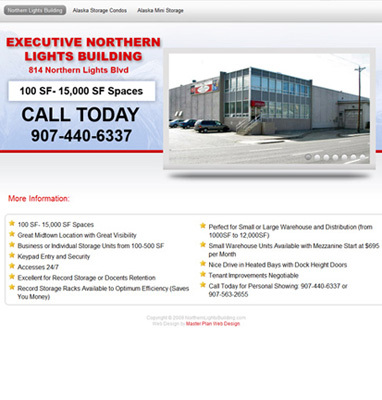 The new owners of the newly re-modeled Executive Northern Lights Building wanted a one-page website that had a sort of "yellow pages ad" feel. So we created a website to meet this need. In order to keep their website clean and concise while still having an array of photos, we added a flash slideshow to the site. 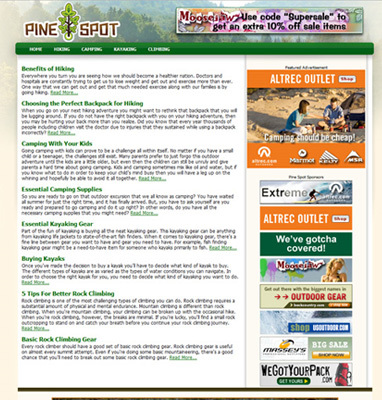 Pine Spot is another example of a basic, static website package. The client wanted a small affiliate website where they were planning to add articles of content to come up in the search engines and profit off of site visitors who clicked through their advertisements. We did the design, created the logo, and coded the website with 100% tabless CSS. 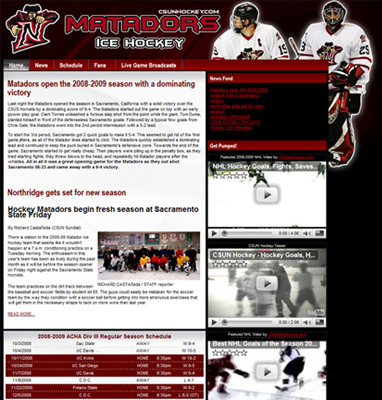 This is the official website of the California State University, Northridge (CSUN) ice hockey team. 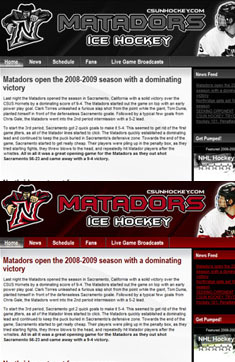 CSUN was one of our first clients. 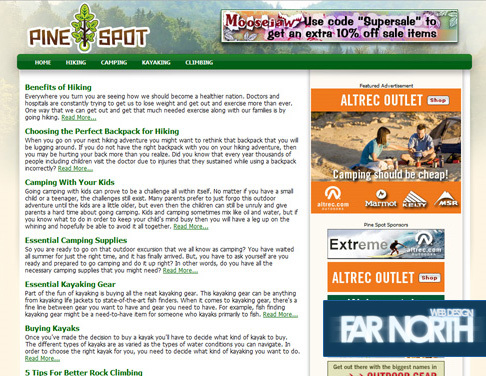 We have completely re-designed their website three seasons in a row now. 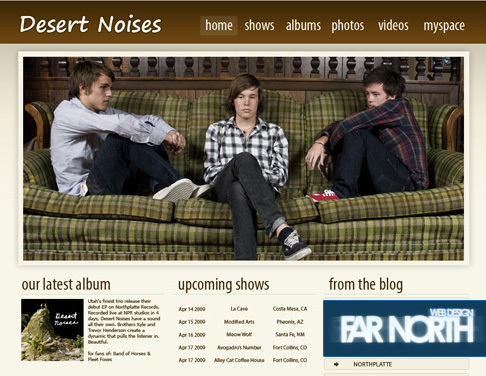 Their website is set up on our favorite Content Management System. This makes it easy for them to update their news and content on a regular basis without having to pay a web company to do it for them. Using a Content Management System is ideal for website such as this where you intend to update your website constantly with news and similar items. 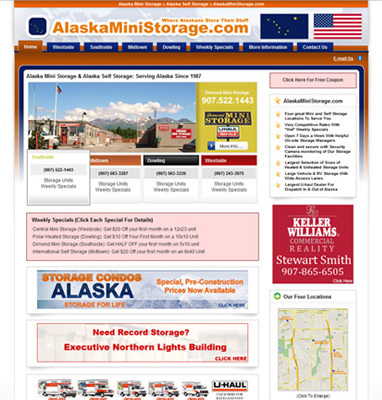 We provide quality website creation and maintenance for Alaskans at affordable prices. When you become one of our clients you can be assured we will always be there for you. You build the business. We build the website. It is no longer a luxury for a business to have a website, but a necessity. The quality of your website is crucial for the reputation of your business. We pride ourselves in creating professional websites to enhance your business. When we create your website, we will start off by meeting with you and working together with you to come up with a plan of attack for your website. We then create a custom design to fit your business. We will go back to the drawing board as many times as it takes to give you the design you want. We will then create your website. We can either update your existing website or create an entirely new website for you. We will graphically design your project and implement it for you. After that we will always be easily available for updates and management. We are absolute Internet experts and promise to deliver an excellent product to you. 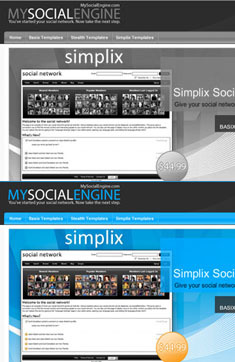 *Note: For website packages, clients must provide all written website content at the start of the project (i.e. articles, descriptions, etc). Some clients feel more comfortable with managing their websites and web hosting services than others. We are here to cater to your needs and provide you with the appropriate level of support you need for your website. We are always here to help. We will always respond immediately to your inquiries and provide you with prompt, professional updates. Questions? Concerns? Comments? We’re here for you. Fill out our simple contact form and a member of our team will contact you immediately. Never fear — we hate spam as much as you do. 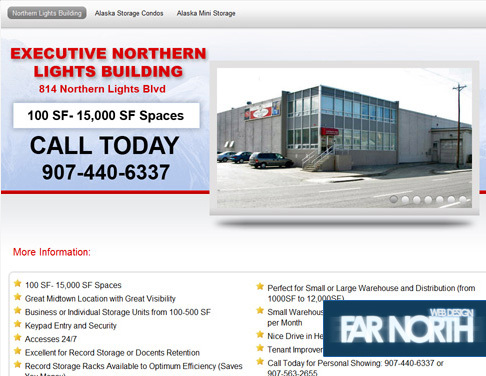 Far North Web Design will never sell any of your contact information. If you are a looking for a quote on a website, this is where you can get the ball rolling. Try to tell us as much about your project as possible. If you're just looking for a website and the terminology we're throwing at you looks like a foreign language, don't worry! We're here to help. You build the business and we build the website. That's the way it works. So, try to give us an idea what you're looking for and we'll help you put it into a practical website plan.